Ocean pollution is a threat to marine life, as well as human life. Ocean pollution is a threat to life as we know it. In June 2017, the threat to our oceans brought representatives from about 200 nations to the United Nations headquarters to determine how to protect the world’s oceans. Our deep blue seas cover more than 70 percent of our planet. They govern earth’s climate, provide most of the clean air we breathe, and help feed and provide a living for millions of people. However, human activity is threatening the health of our oceans and all marine life. The following are just a few key threats to our oceans. The good news is that there is much we can do individually, as well as through initiating and supporting government initiatives, to clean up our waterways and preserve our oceans. Most ocean pollution comes from the land. One of the largest threats occurs as a result of runoff. It is called nonpoint source pollution. Nonpoint source pollution includes many sources that people use, including septic tanks, boats, cars, and trucks. For example, many vehicle engines drop small amounts of oil each day onto roads and parking areas, which eventually makes its way to the sea. Nonpoint source pollution also includes larger sources, such as ranches, farms, and forests. This includes chemical runoff from factories, raw sewage overflow from water treatment systems, as well as agricultural runoff—just to name a few. The largest source of trash in the ocean is plastic. Large and small plastics end up in the ocean from a wide array of sources and activities. It comes from consumer packaging, such as single-use grocery bags, water bottles, yogurt containers, etc. Plastic ocean pollution also comes from car tires, fishing lines, and many other sources. At this time, plastic has been found in tens of thousands of marine organisms and has a wide range of harmful effects on marine life and ocean environments. The worst part about plastic is that it does not biodegrade. And on a yearly basis, over eight million tons of plastic are dumped into the oceans. When we burn fossil fuels, not only do we pollute the air but the oceans as well. 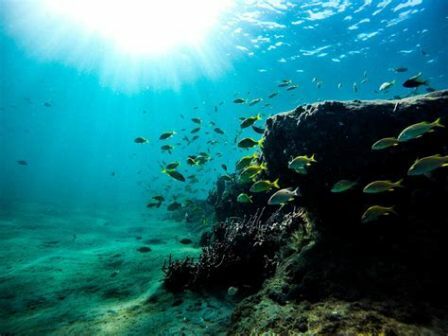 One of the oceans’ main functions is to absorb carbon dioxide from the air. Each year, our oceans take in nearly 30 percent of the worlds CO2, thus protecting us from climate change. However, with increasingly higher levels of CO2, the process changes the pH of surface waters and increases ocean acidification. Acidification is harmful to marine life and contributes to the erosion of coral reefs. It also threatens the American shellfish industry. The only real solution to the growing increase in ocean acidification is to reduce our carbon emissions. The following are just a few simple ways you can make a difference. Land Runoff. Make sure your vehicles and/or boats are not leaking oil or otherwise polluting air or water. Also choose natural personal care and beauty products with nontoxic ingredients. Any product with glitter is especially bad for the ocean. Remember, everything that goes down your sink eventually ends up in the ocean. Plastic Trash. Simply say no to using plastic. Take reusable cloth bags with you when you shop instead of using plastic bags. Instead of buying water in plastic bottles, invest in a home drinking water filter and a reusable stainless-steel water bottle. Whenever possible, eat fresh food and avoid all processed food in package containers. Ocean Acidification. Just a few of the most significant ways you can reduce your carbon emissions is by driving less and eating more plant-based foods. Choose the most-energy efficient appliances, electronic devices, and home services whenever possible. Support Legislation. Check out this NRDC article on Ocean Pollution: The Dirty Facts. This article includes easy links where you can take action on some of these issues.